The thing is , we all are told to accumulate our wealth but we are not told to PROTECT it. Yes you heard me right, PROTECT OUR WEALTH ACCUMULATION. There is always this MISCONCEPTION that WILL WRITING is ONLY for the RICH and those who are NEAR DEATH. The thing is WILL is for all of us , it is for YOU and ME. The truth is death is inevitable regardless of status and we can never ever predict when it will happen. The question is not WHEN but is WHAT IF ITS HAPPEN? ARE WE PREPARED ? ARE WE ABLE TO PROVIDE TO OUR CHILDREN AND LOVE ONES? ARE WE? The amount of unclaimed estates in Malaysia is increasing on a yearly basis. The below are the latest news based on the increased in Malaysia unclaimed estate. 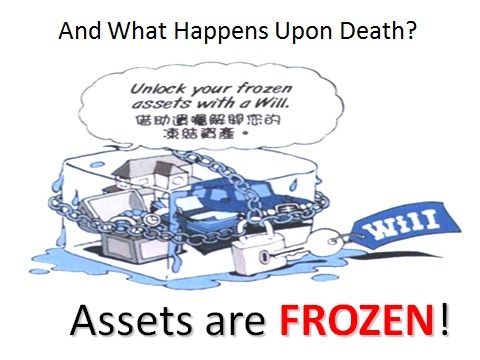 The effect of NOT having a WILL is greater than you ever think of. of 4 and 5 and a housewife age 35. One day John needs to go on a business trip for some discussion and unfortunately the plane crashes and John has passed away. The wife and the children lost not only the husband and dad but the only breadwinner of the family. Jake did not write any will and so the wife has to deal with the stress of John's dying intestate. In other words, the wife has the money but she is not allowed to be accessed as John did not write a will for it. Not only that the house that the wife and the children is staying is now separated into the wife , the children and the husband 's family. I not sure if you can imagine the scenario and how stress the wife could be to handle all this as well as the needs of her children. Let's take a closer example of with will writing and without. TAKES MORE THAN A YEAR. I believe there is no reason for us to lay down the benefits of a will writing because it is clearly much more hassle for the love ones especially when they are lost and sadness came crushing on them when they already have lost you. Let us together , do something so that they are well taken care of even if when we are gone. I would love to share with you more precise on this topic but then it will be full of notes and it is definitely better to meet up and discuss over a cup of coffee / tea. For more information do not hesitate to drop me an email of your contact and name and i will get back to you ASAP.